In this day and age of malicious apps and intrusive government surveillance, you might be wondering how to keep your data secure. You could turn to a solution like the up-and-coming Geeksphone Blackphone, with a modified version of Android and sets of secure communications services. Or you could do what the government does and turn to Boeing. Yes, Boeing. The company that makes massive jetliners, fighter jets, satellites, and all sorts of high tech military hardware is getting into the smartphone game. Their Android-powered entry is the ominously-named Boeing Black. Because stealth. Boeing Black’s security is powered by the Boeing PureSecure architecture, which was designed from the outset for the mobile environment. Our architectural foundation is built upon layers of trust from embedded hardware, operating system policy controls, and compatibility with leading mobile device management systems. The device’s hardware roots of trust and trusted boot ensure the device starts in a trusted state, enabling maximum security of data. Hardware media encryption and configurable inhibit controls are embedded to protect the device, its data, and the transmission of information, significantly reducing the risk of mission compromise due to data loss. Roughly translated: this phone is meant to be secure, from the silicon on up. From disk encryption to hardware crypto engines and embedded secure components, the Boeing Black just oozes with security. According to the FCC filing today that outed the phone and set the ball rolling to tonight’s announcement, Boeing’s even gone so far as to engineer the phone to self-destruct if you try to break inside it. The handset, which is assembled in the United States, also features modularity as a selling point — the back door can be swapped out for any number of add-on modules, including satellite radio transceivers, expanded battery packs, solar chargers, precise GPS receivers, secure discrete radio channels, biometric scanners, and whatever other mission-specific modules they can dream up. In addition to the module expansion on the back, the Boeing Black also has a PDMI port, a rarely-used connection (the Dell Streak from 2010 had a PDMI port) that combines USB, audio, power, HDMI, and DisplayPort output in one connection. Thankfully there’s also a standard USB port for data and charging, plus a microSD slot. YOU MIGHT THINK THAT A PHONE THIS THICK WOULD HOUSE A MASSIVE BATTERY SUITABLE FOR MULTI-DAY COVERT OPS AWAY FROM A CHARGER. YOU WOULD BE WRONG. You’ll be hitting that charger a lot with the Boeing Black. You might think that a phone that’s 13.25mm thick — nearly twice as thick as the new Samsung Galaxy S5 — would house a massive battery suitable for multi-day covert ops away from a charger. You would be wrong. Housed inside that chunky self-destructing frame you’ll find a 1590mAh battery. It’s also heavy, at 170 grams, and has a 4.3-inch 540×960 display of unspecified type or quality. Thankfully there are LTE, UMTS, and GSM radios present along with dual SIM slots, and even Bluetooth 2.1 (yes, the rest of the world is on 4.0 now). 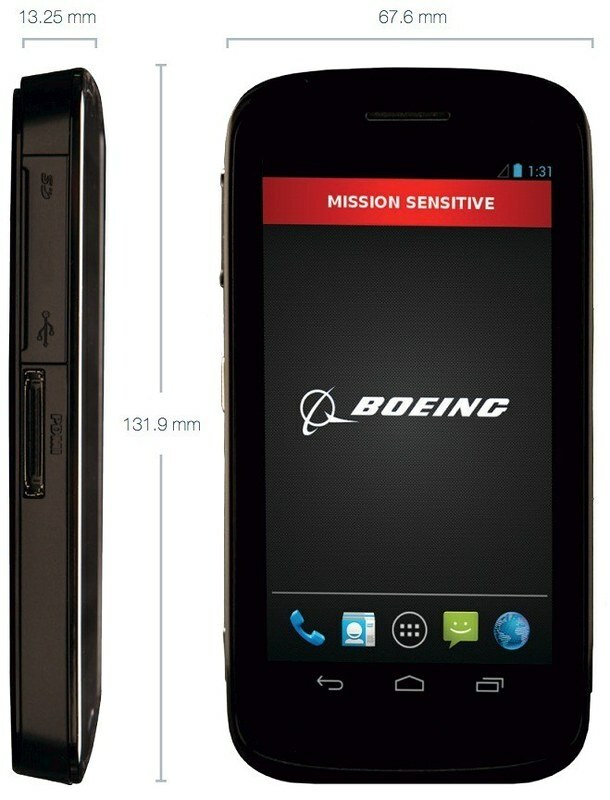 JUST AS YOU CAN’T GET COMPLETE SPECIFICATIONS ON A BOEING F/A-18 E/F SUPER HORNET, THE DETAILS OF THE BOEING BLACK SMARTPHONE WILL REMAIN OPAQUE FOR AS LONG AS BOEING SEES FIT. 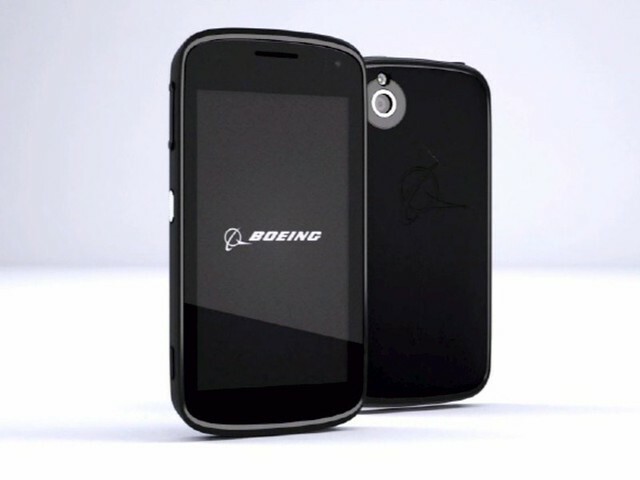 Just as you can’t get complete specifications on a Boeing F/A-18 E/F Super Hornet strike fighter or Boeing’s Joint Direct Attack Munition smart bomb kit, the details of the Boeing Black smartphone will remain opaque for as long as Boeing sees fit. Or until somebody outside the government gets their hands on one and tears it apart. Much of what comprises the Boeing Black seems like it would have been state-of-the-art 2 or 3 years ago. That’s not surprising, given the way that government contracting usually works. With Boeing’s focus on security for the Boeing Black, the specs were likely locked down years ago and the work since then has focused on the security software. It’s not a phone that’s meant for you or me. It’s a phone meant for Special Forces soldiers and CIA agents. But even with the security features in place, we’re not sure it will be up to the task. Boeing has decades of experience as a government contractor and has provided everything from planes and missiles to IT networks to the military and government agencies. But smartphones are a very new thing for them, and the design of the Black isn’t exactly inspiring in confidence of their technical prowess. The government moves slow, but as the recent move by the Air Force to ditch BlackBerry smartphones for iPhones shows, even the powers that be aren’t willing to wait forever. Especially when we’re talking about multi-year government contracts. There’s one more bit of obscurity here: Boeing’s being coy about a launch date and pricing for the Boeing Black. You can be sure the pricing will be astronomical — they’re selling these to the government, after all — but Boeing did tell The Wall Street Journal that the release would be “soon”, which in government contractor terms could very well mean by the fall. This entry was posted in Technology and tagged Black, Blackphone, Boeing, Security, self-destruct, smartphone, Top secret. Bookmark the permalink.